The Geoscience Education Academy (GEA) offers UK secondary school teachers a great opportunity to understand how to teach the geoscience part of the curriculum if it is not their principal subject, as well as existing Earth science teachers who may need a refresher and some new material. The GEA provides curriculum led training and support for science and geography teachers across the UK. Held at the Geological Society, Burlington House, London. With training given by experienced teachers/examiners, the GEA is a fully accredited CPD training course. A complete pack of teaching resources is available to all attendees. The GEA will run again from 23 - 24 July 2019. Registration is now open. If you have any queries in the meantime contact the Education Team. * Please note the GEA is intended for teachers and PGCE students working in the UK/NI. * The GEA is free to attend but the Geological Society is unable to provide travel/accommodation expenses. If you would like to attend the GEA please fill in the application form below. The 2018 Geoscience Education Academy ran from Tuesday 24 to Friday 27 July. 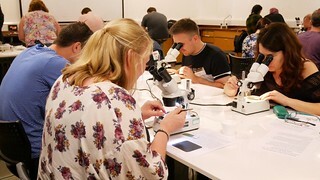 Highlights included a microfossil workshop at the Natural History Museum, a talk by Dr Caroline Smith (Head of Earth Science and Principle Curator of Meteorites, NHM) and an urban geology field trip. We have a private group on LinkedIn for past GEA delegates to stay in touch.